1) DIOR ADDICT LIP GLOW POMADE: an intense lip balm that provides an instant nourishment and protection to the lips, with a lovely rosy tint. The formula in oil-gel contains a high shea concentration that makes the lips plump and smooth. I use it alone or as mask at night. 3) TESTANERA PALETTE VOLUME POWDER: this product is seriously the best I ever tried to provide more volume to my hair, it really works. It's simply a powder that you pour in the hands, then rub them and run the fingers through the hair; the effect is very cool and natural, the hair appears clean and healthy. 4) RAY-BAN AVIATOR GLASSES: timeless and sleek frames, which I love for the irresistible '70s vibes. Love the Ray Bans - so cool! Interessante il lip balm Dior ad anche il volumizzante Testanera! wow these are just perfect! The Dior Addict Lip Glow Pomade sounds like such a nourishing product and the packaging is pretty as well. We were looking for new sunglasses for my husband the other day and one of the styles he tried RayBan Aviators. The shape is so classic and they look great as glasses too. Happy weekend sweet Lilli! I saw that Guerlain lipstick when I was browsing Sephora yesterday, was so tempted to purchase it but ugh...the price hurts my head. LOL! Both, the lip gloss and the Gurlaine Listick are very soft colors. I'm sure these shades looks very nice with a little bit tan. The Ray Ban glasses are really timeless and of course will look fantastic for. Io proverei volentieri i prodotti 1 e 2 ... Ma sai che le Petite Robe Noire è anche il mio profumo preferito? Lo trovo così femminile! I live the packaging of the Guerlain lipstick. So glam! I would like to try the Dior lip glow. I love anything with Shea butter. The Ray ban aviator is truly a classi. So chic and always in style. Have a wonderful weekend Lilli. I would like to try the volume powder. I want the rayban glasses too! Have a great weekend Lilli!!! 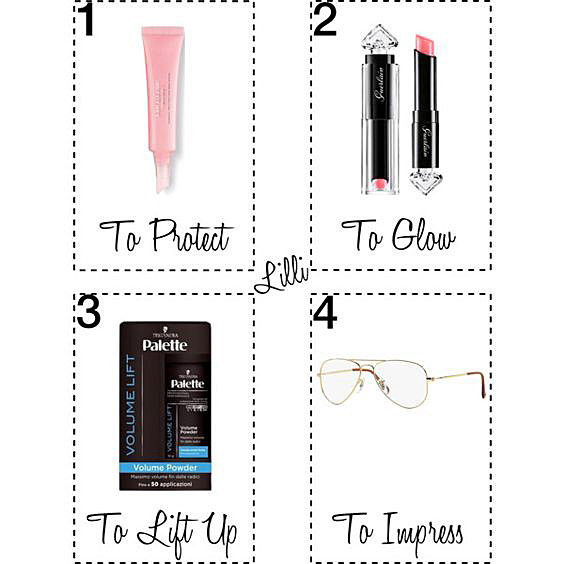 Rose Lipstick and sunnies are my fav in this list, happy start of week Lilli!